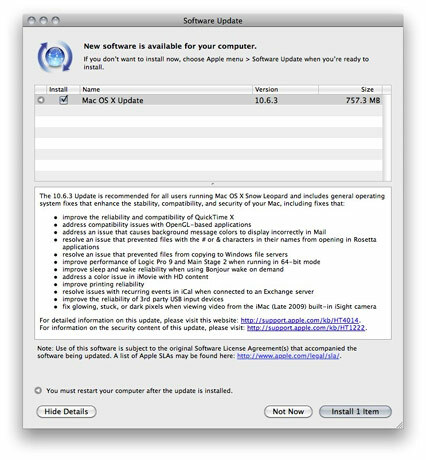 It is important to keep your Mac up-to-date, with each software update comes new additions as well as bug fixes and sometimes security updates. It is important to keep your Mac up-to-date, with each software update comes new additions as well as bug fixes and sometimes security updates. Normally these updates aren’t very large but they still improve the stability of your overall system. Many of you may see the image below jump up on your screen from time-to-time and your either too busy working on something else or simply don’t feel like going through the update process at the moment. So you might want to check now if you have any updates available. Doing this is extremely easy, just click on the apple logo in the upper left hand corner of your screen and select ‘Software Update’ this will reach out to Apple’s servers and determine if your system needs any updates.